You are currently browsing the category archive for the ‘overcoming monotony during workouts’ category. A smile spread across my face. With my razor-sharp pocket knife I sliced open the package that greeted us at our door after a long day’s work. Weariness disappeared with the awaiting gift in a brown cardboard box. One of the ways that I keep my blood flowing during the week is stopping by our athletic club and jumping into the pool. The pool is 25 yards long. For me to swim one half of a mile I need to swim 36 lengths of the pool. For anyone who does or has done it, that is a lot of swimming and it is also incredibly boring. It is not possible to concentrate on technique, lap counting, stroke style or any other related mental feature of swimming. Some mindless lap counting habit needs to be incorporated so that you don’t think about doing it. Then, any variety during the laps is a huge help. I mean ANY variation is a plus. Some listen to waterproof MP3 players. Others, sing to themselves, compose while stroking or just tough it out through the tedious task of lap after lap. I like to throw in some wind sprints. Take the word “like” very lightly. Just to break up the monotony, I put on speed fins for about a dozen of the laps that I elect to swim. Speed fins are shorter than the typical snorkeling or scuba fins. 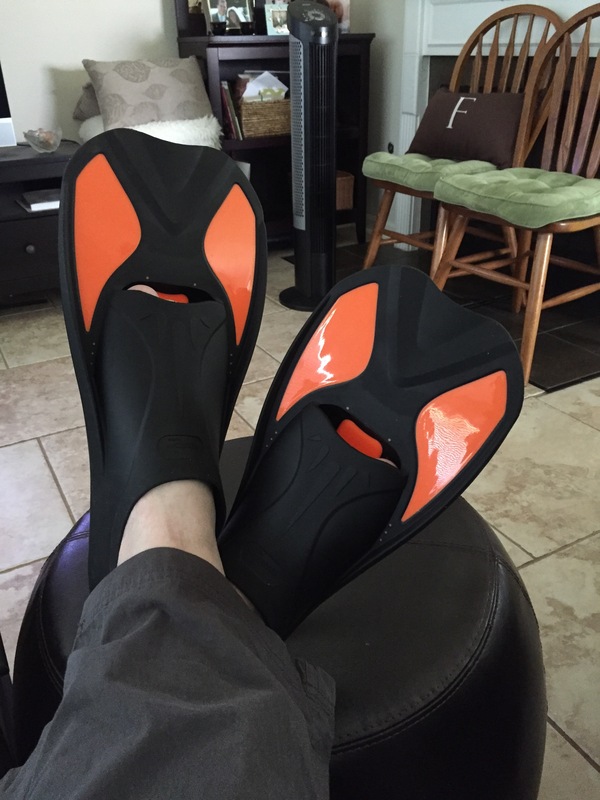 To get the best benefit out of them you kick more repetitions than the ease based snorkeling fins. But, they make a huge difference in my speed. Besides increased speed, the energy expended is enormous. It is like to doing wind-sprints. My lungs are heaving and screaming for oxygen. I can see the tiles racing by on the bottom of our club pool. The wake off of my head feels like a wall of water resisting my progress. Deep breathes are not enough to satisfying my craving for oxygen. Now, my package is opened. New speed fins emerge. I had to try them on and model them for the next visit to the Club. Today I have retired my old speed fins for these faster and lighter style. They even fit more comfortably. They will help me keep the monotony at bay with each workout visit to the club. Want to give them a try?